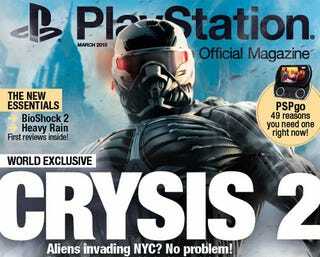 Crytek's sequel to the tropical island set first-person shooter Crysis has a new Nanosuit, new platforms on which to play it and an all new urban setting, New York City, according to the latest issue of PlayStation: The Official Magazine. Crysis 2 takes players to a new urban jungle in the sequel, bound for the PC, PlayStation 3 and Xbox 360, where aliens are apparently invading and faces need blasting. You'll have to pick up the newest issue of the print publication to learn more, but you can gawk at its cover as of right now.